Penny Gore presents a performance of Massenet's five-act comic opera Don Quichotte, given at Chicago Lyric Opera in 2016. Andrew Davis conducts the Lyric Orchestra and Chorus. Opera matinee with Penny Gore. Cervantes' heroic knight errant is just the starting point for Massenet's five-act comic opera "Don Quichotte". Premiered in 1910, it was Massenet's final operatic triumph, and his own situation echoed the fictional relationship between the aged Don Quichotte and the young beautiful Dulcinée. Massenet was infatuated with a singer half his age who sang the role of Dulcinée at the first performance, and Massenet can see the ridiculousness of the situation, but writes tenderly for the pair. Of course there is the Don's faithful servant Sancho Panza and windmills too, and bandits and a stolen jewel that Don Quichotte vows to return to Dulcinée - he thinks in return for becoming his wife. 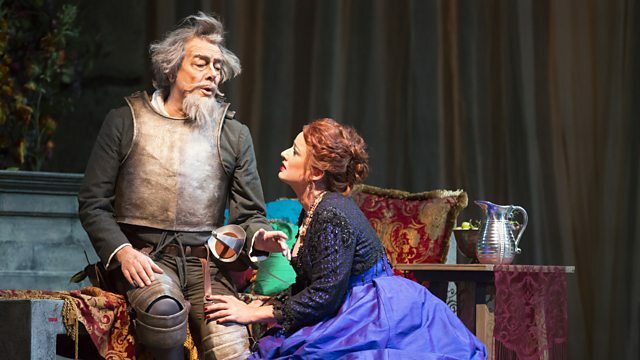 Towards the end of the opera Dulcinée quietly and sensitively thanks Don Quichotte for returning her jewel, but gives him a reality check - their destinies are completely different: she is in the present and looking to the future, he is a relic of the past - they can never be married. Feodor Chaliapin was the original Don Quichotte, and Ferrucio Furlanetto takes the central role in this performance given on Christmas Eve last year at Chicago Lyric Opera and Sir Andrew Davis conducts. Singer: Ferruccio Furlanetto. Singer: Clémentine Margaine. Orchestra: Chicago Lyric Opera orchestra. Conductor: Sir Andrew Davis. Singer: Ferruccio Furlanetto. Orchestra: Chicago Lyric Opera orchestra. Conductor: Sir Andrew Davis. Performer: Stephen Farr. Choir: BBC Singers. Conductor: David Hill. BBC recording, St. Paul's Knightsbridge 18th November 2016.